11/30/09 TODAY UNTIL 6pm - Don't miss FREE SHIPPING on any order $25 or more. Email or call me (919-334-8800) with your order. Limited time, ACT NOW! BLACK Friday Special - November 27-29, 2009 from me only: When you place an order of $25.00 or more Fri, Sat or Sun you will get free shipping from me. You can not order on my website just email me your order on those days and take this opportunity to order from the Stampin Up Specials and get more $ off. 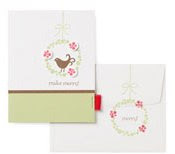 You can call me to give me your credit card number so we can get in the special that Stampin UP is offering too. My order will go in on Sunday night after 9pm. See below this post for Holiday Extravaganza special. Stay tuned for samples from the upcoming mini catalogs, I will preorder some of the items and make cute samples to show you. I have seen the mini catalogs and you are going to love them as much as I do. Occasions Mini - Jan 5, 2010 Sale-A-Bration - Jan 5, 2010 Happy Thanksgiving and please know that I am thankful for your customer loyalty. Stampin'Up! has done it AGAIN. What an AWESOME SALE. CHECK it OUT. CLICK the BLOCKS below to see the products that are ON SALE and Place your order online NOW. Be sure and Check Back frequently this week for MORE Deals! I will post " MY" very own BLACK FRIDAY SPECIAL to you EARLY Friday morning. 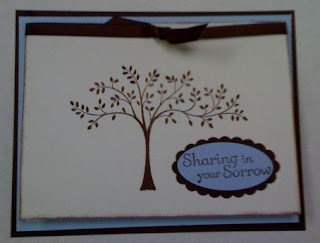 I love the soft colors that seem so appropriate for a sympathy card. Sign up today for my Holiday Stamp Camp! 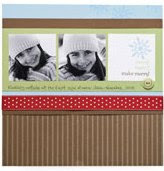 You will be making a scrapbook page, gift box, gift tags and 2 Christmas Cards. Make your reservations now. $25.00 Email me to reserve your spot. Here are a few samples that will be like or similiar to what you will be making. Of course the treat box will have a cute bow and tag on it. Do you like to play bunco and do you like to stamp? Then Stamping Bunco is for you. Join us Monday Nov 9th at 7pm for a fun girls night out at my place. You do not have to know how to play, it is a fun and easy dice game and your prizes are picked from the Stampin UP Catalog. Each player pays $12.50 to play and everyone gets a prize ranging from $5-$40. Contact me today to reserve your spot and for directions. We need 12 people to play and we have a few spots left.